From saying “I Do” in front of a snow-capped mountain to having an intimate backyard affair, adding a touch of nature creates the perfect feeling on your Wedding Day. Whether you choose to have an open-air wedding ceremony, an alfresco cocktail hour, a reception dinner under the stars, or the entire celebration outdoors, bringing in the fresh air for your affair may be the perfect addition you were looking for. Outdoor weddings - when executed properly - can be perfect during any season! We encourage our couples to note that with each outdoor option comes a significant amount of preparation. Let these tips be your guide when planning the outdoor wedding venue of your dreams! Two of the most important aspects to consider when determining your needs for any outdoor wedding are venue and time of year. 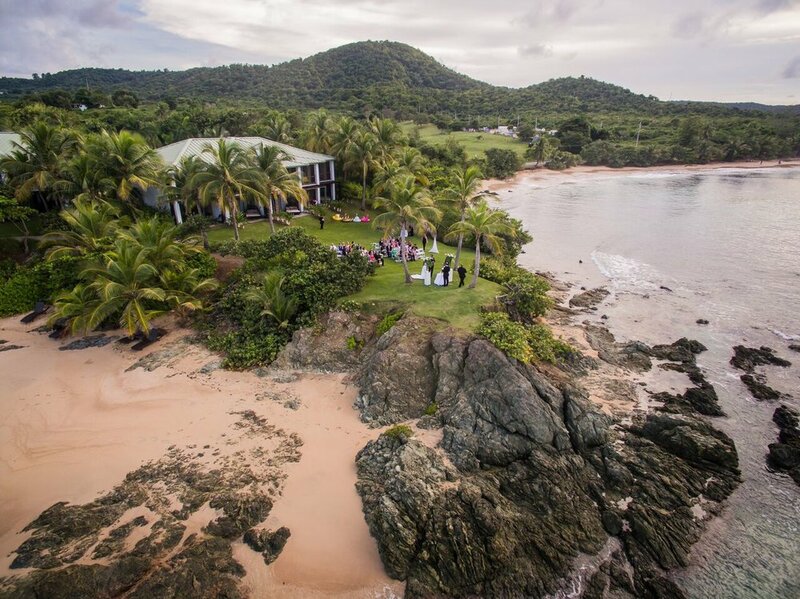 A beach wedding will have a different set of logistics versus a mountain wedding. When selecting your venue, be sure to understand how weather will play into the planning process. Depending on the season and location of your wedding, it is imperative to consider what type of natural elements your specific date may bring. Choosing an Environment: From sand to snow, nature offers a variety of options when planning your outdoor event. Destinations such as Hawaii, Mexico, and the Caribbean offer warmer climate stability and oceanic views, while locations such as Colorado, Arizona, and Tennessee provide for dramatic rocky mountain scenery. Our MAE Bride, Rian Horney, never expected to have an alfresco wedding, but the Park City, Utah landscape won her over. "I never thought I wanted an outdoor wedding because I didn't want plans to change. Then, we saw how beautiful the outdoor space at our mountain venue was, and I couldn't give it up," newly married Rian said. Couples tend to choose stunning natural backdrops for their nuptials, such as rolling Italian hills or white sand beaches. While these options exude romantic ambiance, it's crucial to plan for the challenges that may come with these settings. Venues & Vendors: Once the destination is set, pinpointing a venue is key. The Knot is an excellent starting point that allows you to search their database based on specific location, ceremony type, price range, and setting. Likewise, your planner will assist you in this vetting and planning process basing selections on your vision and budget. Set the Date: According to ABC7 Meteorologist Cheryl Scott, picking an ideal date isn't easy, especially when preparing for the natural elements that could impact your event. "In Chicago specifically, it's very difficult because weather is ever-changing. It can be absolutely beautiful on a summer day or a winter day, so picking that month can be challenging," Scott said, suggesting early Fall as her best option for a Windy City alfresco affair. While your wedding day may be the day of YOUR dreams, the experience should be enjoyable and comfortable for EVERYONE. For their Park City, Utah wedding, MAE Couple Rian and Matt Horney made sure their guests' comfort was a priority. "My husband and I would rather make everyone more comfortable than ourselves," Rian said while providing blankets and advance instructions for their attendees. Communication Is Key: It is important to let your attendees know what to expect by being completely transparent on your invitation and wedding website. Be descriptive about where your wedding will take place so your guests can plan accordingly - whether that means they wear a jacket or bring comfortable shoes, your guest will be appreciative for the head's up. Keep Guests Comfortable: Depending on the season of your event, there will be different weather conditions to outline that will allow your guests to have a positive experience. For warmer months, try something fun such as turning your program into a fan. To remain practical, be sure there are always refreshments available and provide a shady area to bear with blazing hot sun. For colder seasons, consider having heat lamps or fire pits to cozy up the space and add to the ambiance. Providing a warm drink bar and blankets can also help keep guests toasty and tolerable. Having an outdoor wedding likely comes with logistical hurdles you may not have initially considered. Regardless of your venue, these details need to be discussed before signing on the dotted line. *MAE always recommends consulting with a season professional whether it be our team or another non-biased consultant. "My advice would be to really know and understand what your options are if things go haywire, and remember your planner and vendors are fully prepared if things do go crazy," Rian said. Have a Plan B (and Plan C! ): Mother Nature is known to be unpredictable, no matter the location of your wedding or the time of year. Be prepared for unforeseen circumstances by always having a backup plan and mentally and physically arming yourself with alternate options to remedy your Plan A going awry. Your wedding planner can assist you with this much-needed reality check. Watch the Weather: "Always have that Plan B, just in case there is rain all day, a severe thunderstorm, extreme wind, or a significant drop in temperature," Cheryl Scott said. She also encourages couples to begin watching the weather on the AccuWeather App for their Special Day two weeks in advance. This will provide for the most accurate forecast possible for the Chicagoland area. "No matter what the weather, always have a sunny outlook," Scott cheerfully advises! Plan for Bare Essentials: "Some things that aren't always considered with alfresco events and weddings are some of the most basic necessities," MAE Owner Brianne Garritano Vajaria shared with the team. Although the venue of your dreams may be beautiful, it is also necessary to consider how convenient it is or isn't. Kitchen space, refrigeration, accessibility, electricity, running water, and restrooms are all absolute essentials to factor in. This is especially key to consider for celebrations set within national parks and forests. MAE's Tip: When building your budget, keep in mind that additional costs are highly likely due to weather. If predictions call for rain, you should have a tent on hold. If a sudden drop in temperature around the corner, heaters will need to be booked for in advance for timely delivery. While these items can certainly add up, it's important to always be prepared for even the most unthinkable circumstances. We suggest preemptively accounting for them in your budget, as this will save you the surprise later on. Enough with the woes! One of the upsides of having your wedding outdoors is that nature gets to play a large part in setting the tone of your décor. Not only will this allow you to save within your budget by using the surroundings of your venue, there is nothing more beautiful than a natural backdrop itself! Let the organic elements be your canvas and have your décor be the complement. Whether you want to keep it minimal or prefer to vamp up the space, open air will allow for many options. Rather than using décor to cover up, have it highlight the aspects of your outdoor venue that you love the most! Hosting your wedding outside allows your designer the opportunity to get inventive. Play with symmetry, architectural elements and lighting to define your wedding personality and tell your love story. Work with your planner and design team on inevitable rentals and décor components to best utilize the natural space you have, as well as emphasize the organic ambiance. The most important design element will be the natural landscape itself, after all, this is why you chose it! "I remember sitting on the gondola with my husband heading up to our [mountain-top] ceremony," Rian shared. "It's such a crazy day and morning, that being able to have that moment where it's just us, taking in the beautiful scenery and reflecting back on everything was probably my favorite moment." To see how Marquette Avenue Events can help you plan a seamless outdoor affair to remember and, most importantly, assist in making your dream wedding come to life, please visit us at www.marquetteavenueevents.com or call us at 312-585-7265.